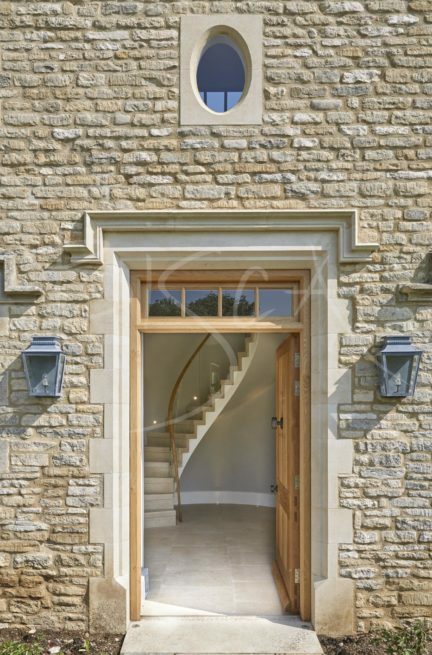 Stone zigzag staircase for Cotswold Manor House. 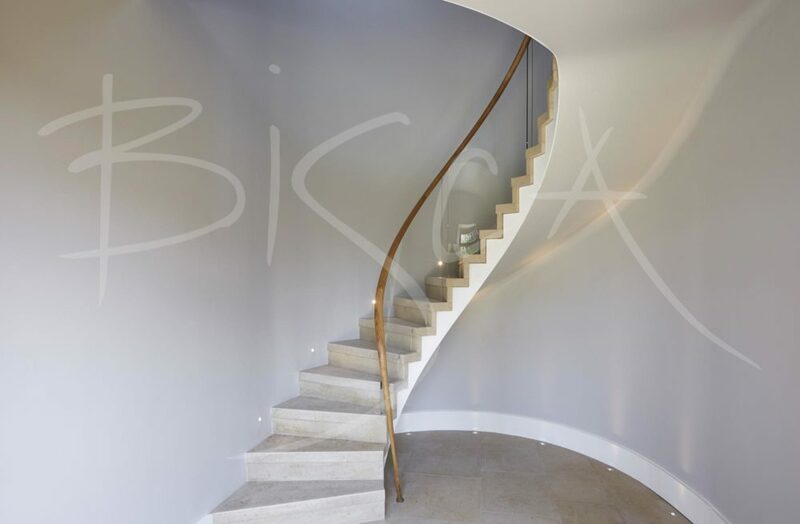 Our brief was to design, manufacture and install a feature staircase in the hall area of a Cotswold Manor House. The space in the hall area was tight, therefore achieving a comfortable relationship between walls, staircase and doorways was key. After discussing the merits of concrete vs steel staircases, our clients chose the steel structure. 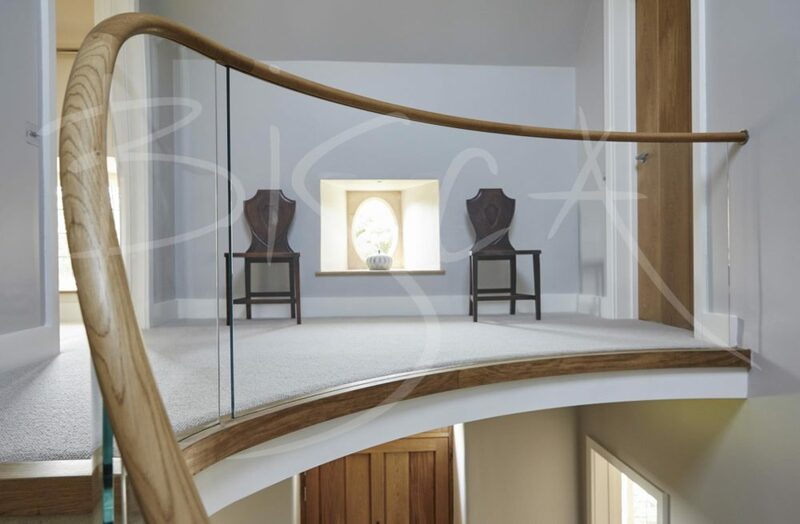 A standard glass balustrade, oak handrail together with a feature newel completed the design options. A comfortable helical staircase climbing from the left hand side of the hallway. A white painted steel stringer supports chunky Bath Stone treads matching the floor finish. The white, plastered underside of the stair creates a sweeping soffit against the curved wall. The contrast between the white plaster and Bath stone provides a clean, contemporary zigzag effect, further enhanced by the slight overhang of the tread nose and calm, neutral colours. 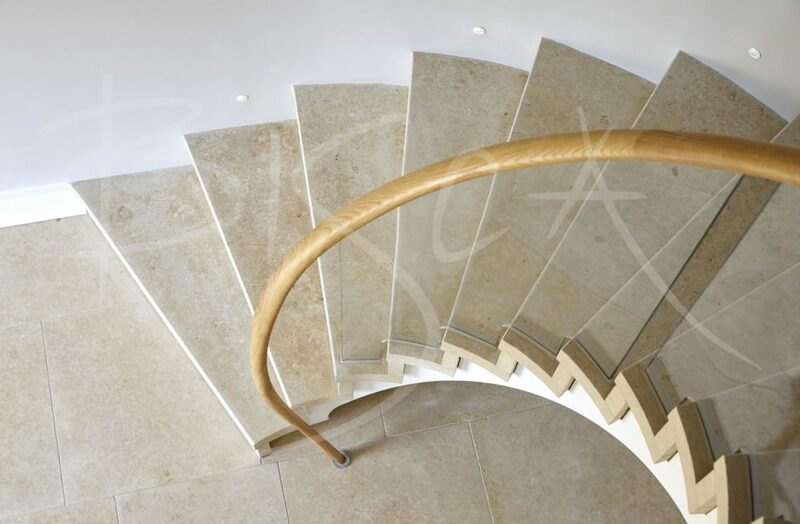 Slotted in the inside edges of the stone, the glass balustrade is capped with an oval profile oak handrail. The balustrade continues continuously up the staircase and around landing gallery edges. The handrail sweeps down into a tapered newel at the foot of the staircase. It transitions from oval profile on the staircase to circular section where it meets the floor. From the outside of the property, the staircase can be glimpsed through the open doorway, nestled against the curved wall of the hall, thus leaving plenty of space for entrance into the hall and access to the rooms beyond. 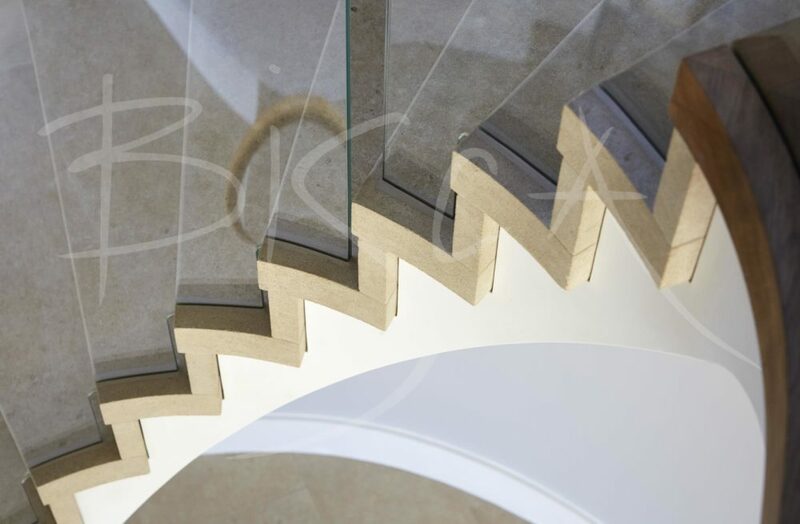 For further details of this contemporary zigzag staircase, or to get a guide price for a stone staircase, please quote reference 4878.